Joan Jonas was born in New York in 1936, received her BA in 1958 from Mount Holyoke College in art history, attended Boston Museum of Fine Arts School from 1958-61 and received her MFA from Columbia University in 1965. Her early work from 1968 through the 1970s were performance in New York at various venues such as St. Peter’s Church Gymnasium; Loeb Student Center, NYU; Bard College; YMCA, New York; University of California, San Diego; University of California, Irvine; Ace Gallery, Los Angeles; documenta 5, Kassel; and Stedelijk Van Abbemuseum, Eindhoven, NL. A retrospective was held in 1980 at University Art Museum, UC Berkeley. During the 1980s and 1990s her performances continued throughout the world. Major exhibitions in which her work appeared were at Cleveland Center for Contemporary Arts, 1994; Museum of Contemporary Art, Los Angeles in 1995; MOMA, NY in 1999; Whitney Museum, NY in 2001; and “WACK! Art and the Feminist Revolution,” MOCA, Los Angeles in 2007, a touring exhibition. Galleries that have held exhibitions of Jonas' work include Sonnabend, NY; Pat Hearn, NY: Galerie Tugny Lamarre, Paris; Galerie Reinhard Hauff, Stuttgart; Wilkenson Gallery, London; and Yvon Lambert, NY & Paris. 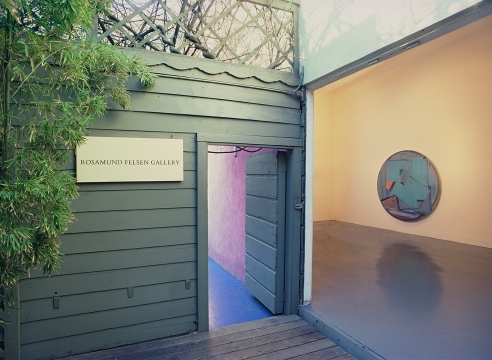 Exhibitions with Rosamund Felsen Gallery include “Mask, Decoy & Other Beasts,” 1996; "In the Shadow a Shadow, Moving with No Pattern,” 2001; “Lines in the Sand,” 2003; and “Reading Dante IV,” 2010. The artist lives in New York.